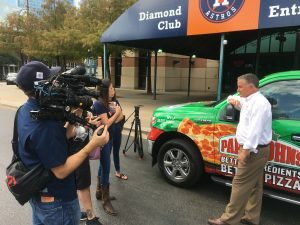 Houston Texan’s J.J. Watt, Houston Astro’s Jose Altuve and Papa John’n Pizza Houston award a Gullo Ford of Conroe F150 as the prize of a hashtag social media campaign. Jose made some pizzas, then picked up J.J. and they delivered the truck to the winner’s home and took him for a spin in his truck. From an audio standpoint, this was a reality-esque single camera car giveaway with bag drops, trucks, crowds and media scrum. A Sound Devices 633, Sony FS7, and Lectrosonics digital hybrid mics and IFB. Moffett Productions and Citizen Doug Productions have developed a track record of successful auto giveaways. This entry was posted in Advertising, Auto, Location Sound, Social Media, Sports and tagged Astros, Contest Award, Ford F150, Giveaway, Gullo Ford of Conroe, Instagram, J.J.Watt, Jose Altuve, Lectrosonics digital hybrid wireless, Lectrosonics IFB, Papa John's of Houston, Pizza, Social Media, Sony FS-7, Sound Devices 633, Texans. Bookmark the permalink.